The recent nostalgia craze that has been sweeping through the moto-world can sometimes lead to brands taking things too far just for the sake of style. That isn’t the case with the new Dainese HF D1 Perforated Leather jacket. The HF D1 is beyond your run of the mill retro styled jackets. Being a faithful representation of vintage Dainese leather, this jacket is a time machine. One look at the colors and Dainese font will instantly throw you into an early 80's reverie where you become the TimeRider. When you throw the HF D1 on you will be literally transported to Europe in 1982, cheering on Graziano Rossi before Valentino was even a glint in his eye. However, unlike its historical counterpart, the new HF D1 offers CE-certified armor and connections to your Dainese pants. 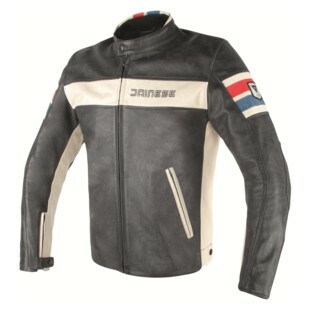 So pick up this time traveling jacket from Dainese and release your inner je ne sais quoi, Jean Seberg not included. With the HF D1 Perforated Leather Jacket, It’s pretty fair to say the best part of this new retro trend is that riders can now achieve that vintage look without forfeiting any of the benefits of modern technology and protection.